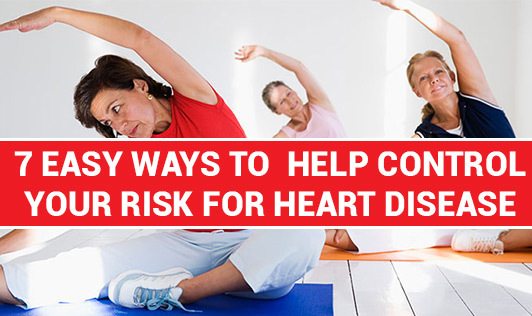 Do you know there are seven easy ways to help control your risk of heart disease? Here are 7 ways to lower your risk. Daily physical activity increases your length and quality of life. If you get at least 30 minutes of moderate physical activity each day (like brisk walking), five times a week, you can almost guarantee yourself a healthier and more satisfying life while lowering your risks of heart disease, stroke, and diabetes. When you control your cholesterol, you are giving your arteries their best chance to remain clear of blockages. Cholesterol is a waxy substance and our bodies use it to make cell membranes and hormones, but when you have too much bad cholesterol (LDL), it combines with white blood cells and forms plaque in your veins and arteries. These blockages lead to heart disease and stroke.